Acting games, play rehearsals, creating sets, inventing costumes, the thrill of an audience and the warmth of friendships old and new … At DRT Summer Theatre Camps every actor is guaranteed a part. In this action packed fantasy comedy/drama, we meet the present day descendants of the 3 magic moms and the 3 teen shape-shifters (Ariel Unicorn, Grandmother Tiger and Naga Cobra) from “The Origins of Dragon Bob” series. Because dragons live for 1000’s of years, the Shape Shifters battle with old favorites like Dragon Bob the Terrible Tour Guide and his scheming sister, Dragon “Queen?” Robena. The series also features fascinating new characters like Jeff Loupe, a Private Investigator who is also a werewolf, Sandra Dee, Robena’s daughter, and Bets Swirlinger, very near-sighted but can see lies hanging in the air above the liar’s head. Plus, you never know who will show up. Monday-Friday from 9:00 a.m. to 3:00 p.m. * Early drop off and after care by arrangement. Public performance on the last Friday evening of camp (7:00 pm). PAY BY CHECK: Make checks to Durham Regional Theatre and mail to DRT, P.O. Box 61894, Durham, NC 27715. After seven amazing summer camp seasons joyfully housed at Trinity Avenue Presbyterian Church, we were both grateful and sad last summer to learn that this warm, welcoming congregation needed to fulfill their strong sense of mission by offering space to Temple Beth El, as they re-construct their own religious home. DRT will always be deeply grateful to the fine folks and outstanding minister, Rev. Katie Crowe, at TAPC for lifting us up, so that by last summer we hosted 9-weeks of full summer theatre camps and reached our annual goal of 50% scholarship participation. We absolutely could not have done it without TAPC. Thank you. Rev. Crowe was a great support as DRT searched for a new summer camp home; then, after 7-months the solution came through a casual answer to a group e-mail - We are excited to announce that DRT is entering into a "start-up" partnership for summer 2018 with Durham School for Ballet and Performing Arts (DSBPA.) It is close to our old home at TAPC, across the street from Durham School for the arts. Why Everyone Needs to Get a SWOP Button - Or a Hundred!!!! Most every day we hear that our city of Durham, NC is "thriving," with prosperity around every corner. DRT supports thoughtful, sustainable city growth that ensures the continuation of our city's treasured character - a stable multiplicity of race and economy that values a strong African American presence at diverse financial levels. With rents and food costs skyrocketing all over town, and our most economically vulnerable citizens - seniors, children and people of color - impacted first and worst by the rapid change, that rich identity is significantly endangered. Durham, NC is caught up in the increasing national gap between wealth and poverty, mimicking economic boom and bust trends that result in increased homelessness along with diminished nourishment and educational resources (including access to the arts that support vital literacy and character development.) The result nationally is homeless levels not seen since the last big recession and a mass of citizens working 2-3 jobs to make ends meet. In Durham, as of 2017 we had lost more than 10% of our African American community since 2010. Families are being forced to leave their homes and communities to seek housing outside Durham. Because current national and local trends threaten DRT's ability to fulfill our mission - and because we believe in turning lemons into lemonade - we have decided to help make the racial and economic injustice visible - With "Stop the War on Our Poor (SWOP)" buttons. DRT artistic director, Jenny Justice, designed the SWOP buttons using photographs from DRT shows and summer camps. Thanks to all the talented photographers and to the actors for their inspiration. The wait is over and the fun is about to start as we gear up for the first DRT acting classes of 2018 this week. You can register today at durhamregionaltheatre.com/classes or with cash or a check to DRT on the day of your first class. If you have any questions, call (919) 286-5717 or email: durhamregionaltheatre@gmail.com. What's Happening with DRT Summer Camps? It has warmed my heart these chilly winter days to receive so many emails asking when DRT will begin registration for our Summer Theatre Camps 2018. It also reminded me that it is time to spread the word about what's happening to a broader community of possibility. For seven amazing years DRT's popular summer camps were hosted in the beautiful, huge Fellowship Hall at Trinity Avenue Presbyterian Church in Durham. It was a tremendous expression of TAPC's commitment to a generously inclusive mission. TAPC'S generosity allowed DRT to grow from two small camps in our first summer to nine solid weeks of camps in 2017 that brimmed-over with an excited and diverse community. TAPC's generosity also aided DRT's financial accessibility vision, so that in 2016-2017 we achieved our goal of supporting 50% of our families with program scholarships. This past summer we learned that TAPC needs to fulfill their mission in new ways now - specifically, they have offered their Fellowship Hall to another Durham religious organization in need of significant housing. We wish TAPC every success, and will be forever grateful for the people they allowed us to serve over the years. DRT's Board of Directors remains committed to serving our diverse community with summer theatre camps in the future. With strong outreach support from TAPC's minister, we have been searching for a new summer home - and we will continue searching with the intention of offering the camps this summer 2018. But we have not met with success so far. If you have a contact for our search, please call (919) 286-5717 or email durhamregionaltheatre@gmail.com. At this time of year, we understand that many families must make decisions regarding their summer plans and enroll in other popular camps before they fill-up. We hope you will continue to visit our Summer Theatre Camp webpage: durhamregionaltheatre.com/theatre-camps. And we hope to have fun creating great theatre with you in the future. What's in Your Bag This Holiday Season? Our dear friend and DRT actor, Michael Gibson, passed away in the early hours, Friday, December 8, 2017. His death was caused by an aggressive cancer that was beginning to tell on Michael even as he performed so beautifully with us in "Walk Two Moons" last year. Michael fought bravely and was supported by a broad community and a loving family. The last time I saw Michael was only last month when he came, weak, but well-supported by family and friends, to sit on the front row as Naomi performed her DRT acting class fall showcase. Michael never missed Naomi's shows. Now we will miss him, but we will not forget. A memorial service is being planned for Michael; we will post the details on our Michael Gibson web page. It is Holiday Fundraising time. DRT invites you to enjoy this short movie celebrating why we are dedicated to keeping Durham Regional Theatre alive and thriving in 2017-2018. Then go to durhamregionaltheatre.com/donate and make a difference with a creative gift to DRT. Wishing all our DRT community a joyful holiday season. We found success with the offer of space for our fall 2017 8-week acting classes, at the warm, attractive CityWell Church on Chapel Hill Road in Durham. DRT and CityWell agreed to see how things went with our new partnership before planning beyond November. We have very much enjoyed being at CityWell this fall; our 37 young actors have grown relaxed and brave on the pretty stage. Just this week Co-Pastor Cleve May told us the partnership is working for them as well and we are welcome to stay. As summer ends and the leaves turn toward autumn, DRT's 2017-2018 season starts the week of September 11-16, 2017. DRT kicks-off our 8th SEASON of multi-racial theatre, classes and summer theatre camps with old favorites and some great new ingredients. After three great and growing years at EK Powe School, DRT is excited to begin acting classes next week in our new location at CityWell Church. (Just about a mile from EK Powe, at the corner of Huron Rd. and Chapel Hill Rd.) Plenty of FREE PARKING on the street and in the church lot. on Wednesdays, 4:30 pm – 6:00 pm, 8-week class begins on September 13, 2017. Teens have been asking for an acting class all to themselves, and here is our answer: YES! The class will be shaped around the teen actors with choices in improvisation, scene study, character work, voice training and audition monologues. Jump in – help invent a new class and have a great time doing what you love. Begins in the DRT Friday class, “Creative Acting 2,” for ages 9-12, 4:30 pm – 6:00 pm, 8-week class starts on September 15, 2017. DRT’s Friday class of experienced actors aged 9-12 performs original plays written by director, Jenny Justice. Popular plays become a Play Series, further developing the characters and plots. Past successful series include “Ghosts R Us,” “Spacetime: 2075,” “The Blue Moon Shape Shifters,” and “The Origins of Bob the Dragon.” Students asked for a 5th series, and here it is. “Terry the Time Traveler” takes its first voyage starting on Friday, September 15, 2017. We are all excited to find out where and when the first journey will take her. Join the brave, funny and fabulous Ghosts R Us team for their 6th adventure, this time on Angel Island in San Francisco bay. Teresa, Jeresa, Tammy, Sue Ellen and Sara discover all is not well among the ghosts of Chinese immigrant children ("Paper Children") who were kept on the island during the U.S. exclusion laws (1882-1940.) The GRU team leaps into the ghostly world to help the ghosts solve their problems and move on. On Friday, June 9, 2017, Fatou Njie, will join her senior class from Kestrel Heights School to walk down the aisle at North Carolina Central University’s McDougald-McLendon Gymnasium and receive her high school diploma. Saturday morning, June 10, Fatou Njie will start work as DRT’S ACM – assisting artistic director Jennifer Justice in training DRT summer teaching assistants from middle and high schools around the triangle. Ms. Njie’s ACM work will include supervising these teen teaching assistants. Last year Fatou was a summer teaching assistant herself, making her DRT’S third teaching assistant to “Mentor-Up,” first volunteering in a variety of ways then being paid a stipend as a vital member of DRT’S summer camp staff – and receiving crucial work experience for the future. We’re proud of the leaders we help to train at DRT; we benefit from their talents, dedication and skill. We are pleased to announce the hiring of Fatou Njie as our ACM, summer 2017. From June 10th – August 18th, Ms. Njie will coordinate or carry out most on-site administrative aspects of DRT’S successful summer theatre day-camps for ages 5 – 18 -years. Additionally, the ACM supports 4-6 teen interns per camp and assists with camp activities, leading acting games and helping actors rehearse their shows. She is the first line of communications with the facilities manager at our beautiful Trinity Avenue Presbyterian Church campsite. Fatou Njie’s previous experiences with DRT made her an ideal candidate for the ACM position this year. She was first attracted to DRT through our website, looking for a multi-ethnic theater group. She auditioned for DRT’S 2016 original musical, “Alice,” and was cast in several small roles, including the chorus. She also got involved assisting with and participating in DRT winter and spring advanced acting classes and Hamlet Project Durham. She volunteered as a teen teaching assistant for summer camps 2016 and participated in the three-week Teen Theatre Conservatory. 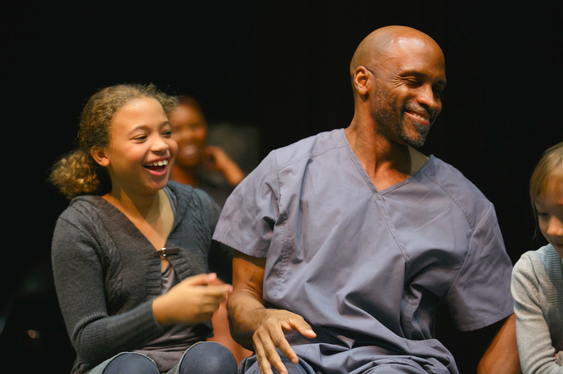 In fall 2016, Ms. Njie was directing assistant for DRT’S first Main Stage show of the season, “Walk Two Moons,” by Tom Arvetis based on the Newbery Medal-winning book by Sharon Creech; when an actor fell ill, Fatou took over acting her two parts, while continuing to participate in Hamlet Project Durham through spring 2017. Fatou Njie says: As an intern last year … I learned how important it is to make summer camps a positive and enjoyable learning environment for not just the campers, but also the interns ... Some of my skills include being a hard worker and keeping my head when people around me are losing theirs. At Kestrel Heights High, Fatou is renowned as an artist and a fencer. She believes fencing will give her the speed and agility of mind and body required for the hard work of supporting DRT’S exciting summer theatre camps. Fatou hopes being part of our team will help her reach her goal of being accepted at The American Musical and Dramatic Academy. She has a good start, as AMDA has offered her VIP status, meaning she will not be charged an application fee and is automatically considered for scholarships. 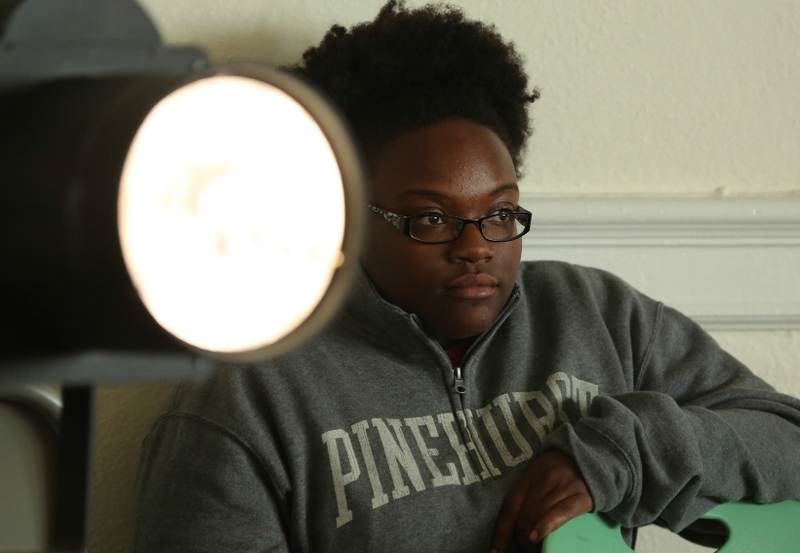 Ms. Njie is also applying to North Carolina A & T State University’s outstanding theatre program. We welcome Fatou Njie to DRT’S summer camp staff and look forward to a successful 7th summer of theatre and community! From DRT Artistic Director - Yesterday I was thinking about Baba Chuck being cared for by loved ones, wishing his soul a peaceful passing, and I had the sudden thought - "Oh, no, I never saw Baba Chuck dance!" And though I plan to go to a website somewhere and watch a video of Baba Chuck dancing - I'm already certain what I will see again is his wide generosity in skillful, creative, living motion. Working with DRT Summer Theatre Camps is exciting and satisfying because you know you have made a positive difference, gained vital skills for the future and earned recognition for service to an established not-for-profit. DRT is an intentionally multi-racial and intergenerational arts and education organization serving Durham for seven years. The salaries are small – contract and stipend level – but the rewards are huge. DRT Hiring Policy: DRT does not discriminate in regards to race, age, class, gender, sexual orientation, or special abilities. All are invited to apply for all positions. DRT is grateful to the Durham Arts Council and the North Carolina Arts Council for their support. 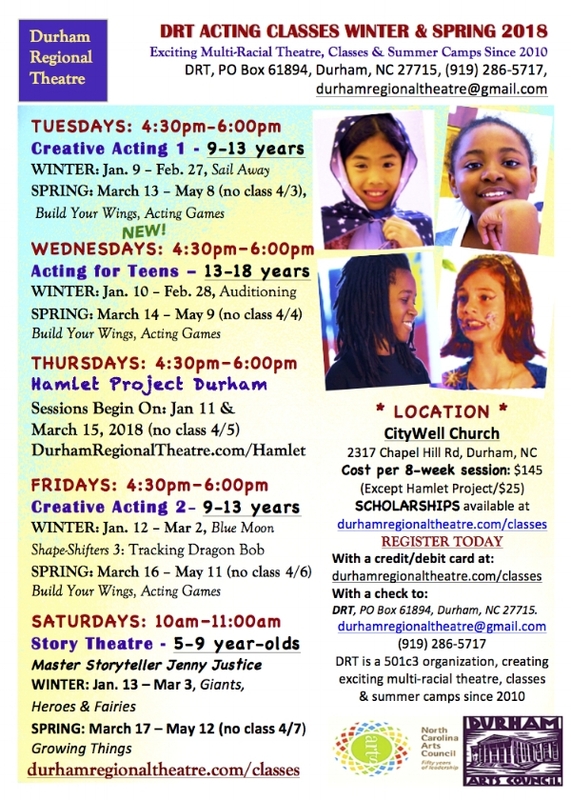 Location of Jobs: All DRT Summer Theatre Camps 2017 are held at 927 W. Trinity Avenue, Durham, NC (Near Durham School for the Arts) in the fellowship hall of Trinity Ave. Presbyterian Church.